Although today’s digital marketplace is constantly evolving, time-honored tactics — like email marketing — remain a go-to strategy for any Long Island business. According to Salesforce, for every $1 invested in email, the average return is $38 — making it one of the most lucrative channels to nurture leads and close sales. There are businesses who still utilize traditional direct mailings, which can range in price from 30 cents to $10 per piece. 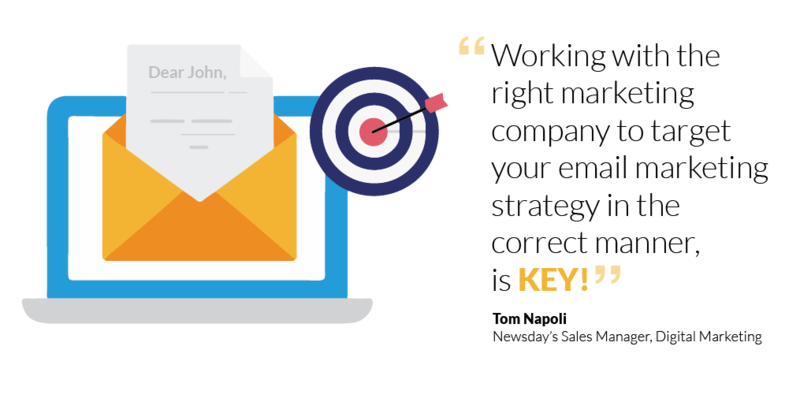 With email marketing, businesses can target a specific “mailbox” for pennies on the dollar! Realizing those rewards, however, calls for having the right email strategy in place for your business. Content is king across every medium today. So, be sure that the email content you deploy offers not only helpful information, but as aggressive a call-to-action, or offer, as possible! When you keep your content relevant to the recipient and focused on a few actions, customers will have more reasons to turn to your brand. Great visuals and infographics too, can help illustrate your message, but make sure they are mobile friendly. And above all, don’t forget the human connection. Even if your email process is automated, your recipient is not. Research has shown that mobile email accounts for 50-75 percent of email opens (depending on your target audience), and that 80 percent of users will delete an email if it is not optimized for mobile. 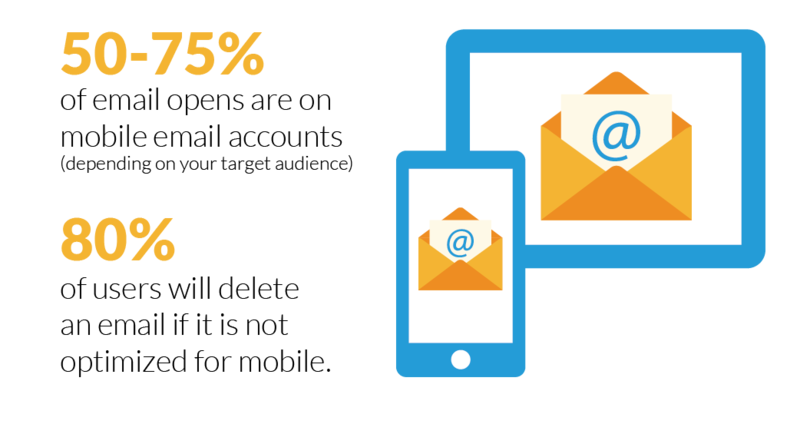 That’s why we strongly suggest a mobile-first approach when it comes to email marketing. Go beyond recipient name to tailor emails by location, past purchase, predictive behavior or other customer data you may have. This way, your prospects and clients get messages that they can directly relate and respond to. When it comes to email marketing, sometimes simple is better. We are seeing a resurgence of interest in text-only emails. Prospects and customers appreciate it when the message more closely resembles a personal message from a friend or family member than a slick commercial message. The other side of the coin is the popularity of interactive content. Emails that educate and entertain with galleries, quizzes and GIFs can increase engagement. Plus, they have the added benefit of training your recipient to look forward to—and open—anything that comes from you. At the simplest level, make sure any emails contain links back to your site and/or social media networks. After all, engagement is the name of the game in email marketing. We include video here because it is one of email’s hottest trends. According to the Martech Advisor, adding videos to your email efforts can increase click rates by over 300 percent. Not surprisingly, when you consider the wide acceptance and usage of video on social media. Even big companies, like Newsday, are still exploring how to make the most of the video experience in email messaging. In the end, your email marketing efforts will be only as good as your lists. With increased standards from the major Internet Service Providers and LAX data management on your part, your email can all too easily be rendered undeliverable or as SPAM. Take the time to clean your lists and then schedule the time to do so on a regular basis. Also try and change your thinking from quantity of sends to quality of recipients, to further impact the inbox. That means making sure you are servicing your own clean email lists and working with a qualified email marketer to develop email creative and distribution that targets new email users on your behalf. Make 2019 the year you ratchet up your email efforts by embracing the industry’s best practices. Newsday can help. Our email marketing programs are designed for small businesses to make a big impact.